Today's installment of The Notebook Fashion and Style Week is all about Allie's gorgeous wardrobe and how you can make some of her beautiful outfits for yourself. One of my favorites that I have actually made is the cardigan that Allie wore on her first date with Noah. 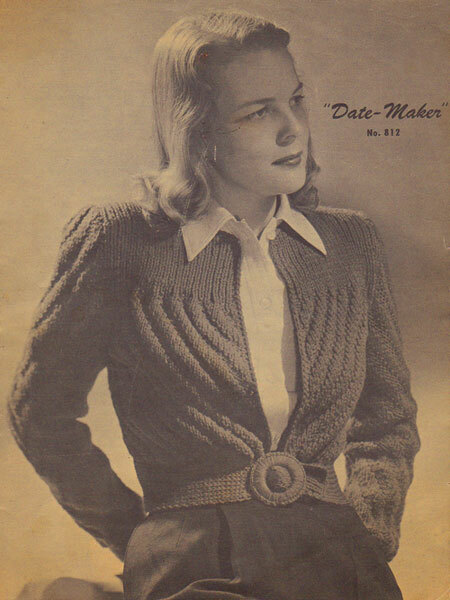 Thanks to Tasha from By Gum By Golly, The 1946 Date Maker Cardigan knitting pattern is available for free download. This was the first thing that I have ever knitted and I have to say, once I figured out how to knit, it was pretty easy and turns out quite beautifully. 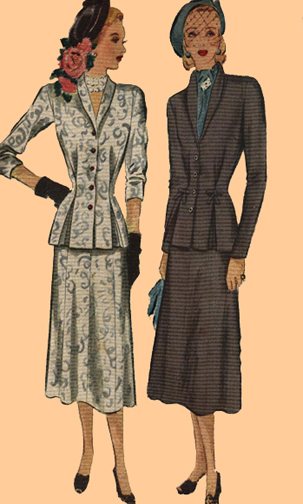 The diagonal "V" ribbing is very appropriate for 40's fashions. Pair it with a dark floral dress and gorgeous pumps and you've got yourself a perfect first date ensemble. 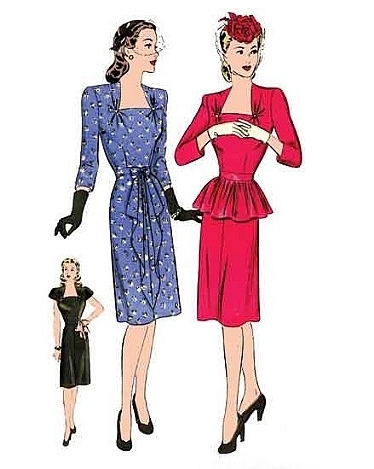 I couldn't find an exact pattern for this dress but the 1940's cocktail dress from The Vintage Pattern lending library comes pretty close. Using F1449, remove the peplum, add a belt and ruffle to the 3/4 sleeve. Allie accessorizes this beautiful green dress with olive green gloves, cream handbag and ankle-tie shoes. The most memorable outfit from The Notebook is Allie's red and white beach outfit. The high waist beach shorts and halter top balance each other very well and for extra fun- a pom pom headband. Patterns for the Beach Bra, Turban, Beach Shorts are available in PDF format from Mrs Depew Vintage. That suit it AWESOME!!!!! Can you make me one, I'll be your Best Friend. LOL. I'm sure hat the costumer in charge had a wonderful time planning Allie's outfits. I'll take a look at that First Date sweater to see if the measurements will fit me. I'm not brilliant at knitting and have no idea how to resize patterns. I'm a 44 bust and I just went up two needle sizes, I think and it fits great! I'm with you- no idea about adjusting knitting patterns! I have lovely pumpkin coloured skeins waiting to be made into a Datemaker. Can't wait to cast on! I adore posts like this (as I'm no stranger to trying to replicate vintage outfits from various movies myself), and hope that you'll do others like it (centered around different films, too, in the future). Yummy! I've been pondering casting on The Date Maker Sweater once I finish the sweater I'm working on. I may have to now!